The people who do movie stunts are made of tough stuff, but one of Paul Rudd's stunt doubles from Marvel's Ant-Man and the Wasp is more than tough. He's inspirational. A new photo from the set of the film from Atlanta-based photographer Joe Passori reveals that stunt double Brett Smrz is an amputee. You can check out the photo of Smrz suited up as Ant-Man below. Smrz, who is shown in the photo with his costume pants rolled up to reveal his prosthetic limb, lost his leg in a trampoline accident when he was 16. However, the injury hasn't slowed the performer down. Smrz told Gaisocioch Magazine in an interview that he doesn’t see having a prosthesis as much of an issue, especially after an encounter with another amputee stunt performer when he was a child. "When I was nine years old, I met Casey Pieretti," Smrz told the magazine. "He was working on Inspector Gadget with my dad. I saw him with his prosthetic leg on two tilts running down a street. That was the first time I met an amputee, and that really stuck in my brain." The encounter, which happened years before Smrz's accident, stuck with him. "So, after my accident, I thought that if Casey could do that, then why couldn't I." 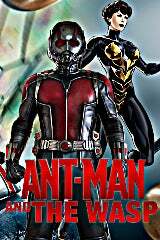 Ant-Man and the Wasp is scheduled to premiere in theaters July 6, 2018.